Your business is growing, we're here to help. Professional local support available for troubleshooting, local access to your hardware. Amplex data centers feature battery bank, generator and redundant input power. 95% usage billing for bandwidth. Don’t pay for more then you need just because you experience a few hours a month of very high usage. Power audit after first month to lower your power bill to actual usage so you don’t overpay for power you’re not using. Customizeable pricing from 1U to Full Racks. Options for rack & shelf servers. Co-location is the perfect option for any size business that needs secure and reliable hosting without the maintenance and IT costs. We offer industry standard pricing per rack unit with customization for your bandwidth and power needs. If you’re looking for somewhere to host a single 1U server or a full rack we can offer you a reliable, safe and local datacenter. 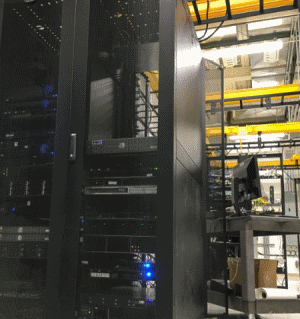 Our datacenter, located in Luckey, Ohio features redundant multi-homed 10G fiber connections to tier-1 Internet backbones Level 3, Hurricane Electric, and Indatel. Redundant electrical power supply along with advanced battery backup and a dedicated diesel generator provide proven the reliability you need. In the event of longer power outages, a 400 gallon on-site fuel tank is full at all times and in the case of emergencies, priority fuel delivery agreements are established. Business hours datacenter access & crash cart usage. Pricing is based on your needs, but these are our most popular package requests. Our knowledgeable Business Sales Engineers are available to go over your specific needs and customize a solution to fit your goals. Need more information or want to customize a solution to fit your business? Amplex business sales engineers can go over your specific needs and goals.